Due to the bank holiday there will be no lotto results in this week’s notes. Both results will be in next week’s notes. Photo shows Paddy Joe Sheehan presenting the Jim Deane Cup to the Cloyne captain. 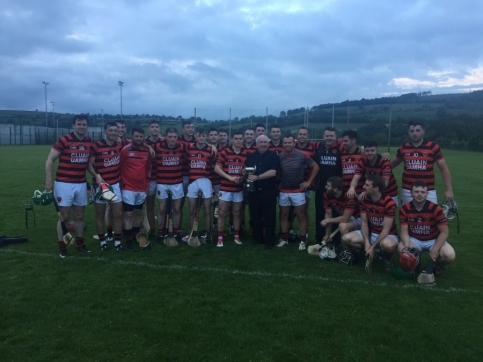 Our senior hurlers were defeated by Cloyne on Friday evening last. Thanks to everyone who made sandwiches and brought cakes. Thanks also to Amy and Aoife who served the refreshments after the match. Best of luck to the boys and girls of Scoil Mhuire who will play their hurling and camogie county finals on Thursday. Best of luck to Dean Beecher and Shaun Henley who are part of the minor panel that play Limerick on Sunday also. We had six teams taking part in this years jumping jacks under 8 hurling tournament. Cois Bhride, St Catherine's, St Carthages, Cappoquin and Abbeyside x 2. Each team played each other in a 12 minute game and the winners were the team that scored the most goals over the 5 games. This years winners were St Catherines, well done to all involved. Well done to our u11s who won the Michael Condon memorial shield tournament last Saturday. The 2018 Poc Fada will take place today Wed 6th June in Mahon Falls. The winners of each event will go on to represent Waterford in the Munster Poc Fada in The Burren, Co Clare on Sat 16th June.